Want to stand out from the crowd this holiday season? 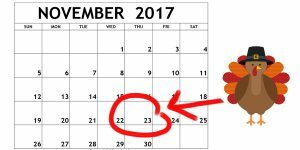 It’s simple; shift your holiday gift-giving calendar 3 weeks earlier to Thanksgiving. Not only does it make sense to tie your client gift to a holiday dedicated to gratitude, it also allows your company to beat the competition. Your gift will stand out, because it won’t be relegated to the black hole of Christmas gifts…the conference room table crowded with holiday presents. Instead it will be proudly displayed, by itself, in a place of honor. And that’s not all. While in the past, you may have had to make hard choices about which clients even got the premium gifts, using this Thanksgiving gift trick, you can afford to send top-notch gifts that are exceptional (but not ridiculously expensive) to even more of your clients. That’s because you don’t have to try to outspend other companies just to get noticed. Instead you can focus on high quality gifts that represent your company well. Your marketing budget will thank you and your clients will be thrilled. What’s even better? You’ll also be able to target prospective clients in a way that will get you noticed. Who wouldn’t want to work with a company, like yours, that takes gratitude seriously? So this year, get into the spirit of the holiday, Thanksgiving, and start your new year even earlier with great referrals and new business in December while others are still shopping for client gifts. Your 2018 bottom line will thank you! To ensure pre-Thanksgiving delivery, and amazing results, call Deb Walton before November 15th at (317) 782-4438.